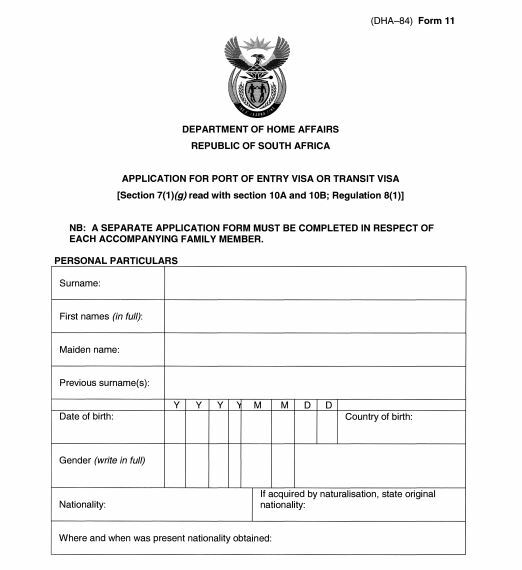 Please note, the following page is intended to assist South African visa applicants prepare their visa application themselves by providing commonly accessed South Africa visa application forms and directives for download. It is by no means a comprehensive outline of the documentation required for every type of South Africa visa application, but does provide guidance on assembling a basic visitor’s visa application. For assistance with more specialised South African visas, take our Free Online Assessment now, or use our submission form at the bottom of this page to ask for assistance in finding the form or documents you require. What documents are required in order to apply for a South African visa for visiting purposes? Your passport or an official travel document that is valid for no less than 30 days after the expiry of your anticipated visit to the country. A yellow-fever vaccination certificate is required if you have transited through a country for longer than 12 hours where there is a risk of yellow fever transmission. Who can apply for a visitor’s visa to South Africa? For more information, see our Visitor’s Visa to South Africa page. Stoogle.co.za – The all purpose information platform for students.